Sit down with Jeremy and share your vision for your portraits. He'll want to learn about your family and why this time is important to you so he can discover how he can capture the emotion and story of this season. You will be inspired by the wonderful decor and portraits adorning the walls in the Gallery as he guides you through the smallest details and helps you maneuver the bigger ones. Clothing selections, your home and personal style and the wall on which your portrait will live will all be discussed. Designing the look and feel of your portraits before your Portrait Sitting will ensure everything goes smoothly and the end result will be a personalized, world-class art piece of your family that you will never want to take down. Camera studies are conducted on select dates at the J.Ridout Portrait Gallery. Our Modern Classic Portraits, Fine Art Black & Whites and our Treasured Moments are all created here. Many of our clients choose to bring their own heirloom furniture pieces while others opt for our selection of antique and transitional items. Our backdrops are hand painted and selected specifically to complement your skin tone, clothing choices and style. It is not uncommon for our clients to want their portrait created on location. Whether you desire a scene that holds special significance to you and your family such as your home, ranch or favorite vacation spot, or you simply prefer the outdoors to a studio setting, we have set aside a limited number of location dates during the Spring and Autumn seasons to accommodate.A few weeks before your scheduled date, Jeremy will visit the selected location to make a plan for your sitting, choose the best scene based on your desires, and finalize the meeting time. An important part of our service is image selection. You will be invited to our Gallery where you will be presented with the candidate images from your sitting. We will guide you through an easy process to determine which images best reflect the likeness of the subjects, selecting the images that capture the perfect emotion, pose, expression, and story of your season. Beginning with the camera to capture the subject's likeness, but moving quickly to pigment ink, acrylics, oils, brushes and canvas, Jeremy masterfully blends the techniques of the Old Masters with today's resources to create an exceptional style of hand-crafted painted portraits. This style of fine art portraiture captures the exact likeness of family members so that the legacy of family and stories of the subjects can be passed on for future generations. Watercolor portraits are painted pieces created on fine art watercolor paper. With the colors and tones of your portrait applied, the texture and depth of these archival papers is simply astounding. Within our signature presentation, floated inside of a double mat, the watercolor is a stunning contemporary art piece for any home. Our fine photographic canvas wall portraits are created unlike most others. The resin layer is stripped from the back of the photographic print to expose the paper fibers and the photographic emulsion is embedded with heat and pressure onto canvas. The result is a stunning photographic portrait with a beautiful canvas texture worthy of long term display in your home. The canvas is then mounted on stretcher bars and finished with an oil glaze for perfect tone and longevity. Our fine art black and white portraits are fine-tuned to enhance clarity, depth and skin tones before being printed directly onto imported, fine art baryta paper or a finely weaved giclee' canvas. The finished portrait has a beautiful tonal range and very deep blacks, perfectly highlighting the faces and relationships of your loved ones and is an excellent choice for any wall in your home. Many clients find that they love so many of the images we have created, but simply cannot display them all in their home. 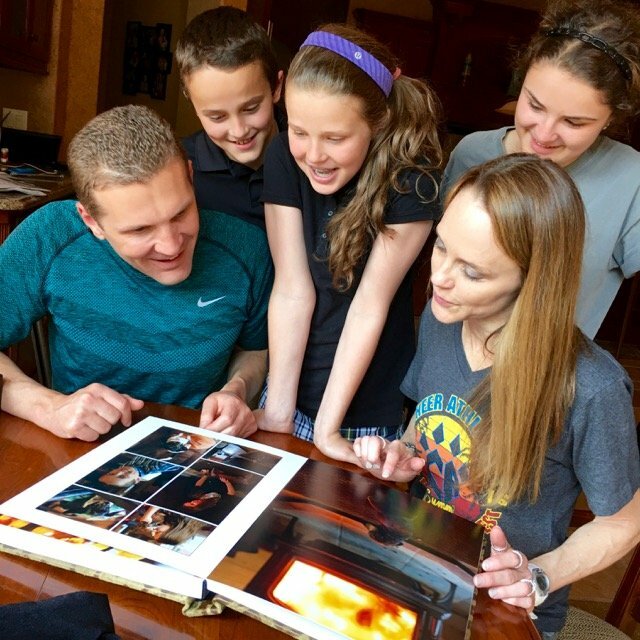 A leather-bound Legacy Album of these treasured portraits is a great place to preserve all of the expressions and poses that finish telling the family's story. In most cases, when a portrait is framed by J.Ridout, your portraits will be delivered and installed in your home. Our clients find this white glove service incredibly valuable--no worry about hardware, levels or risk of damage as the portrait sits around waiting to be installed by your spouse. Arrangements for installation can easily be made for clients that live too far away. Be sure to visit our Portraits in Homes gallery.